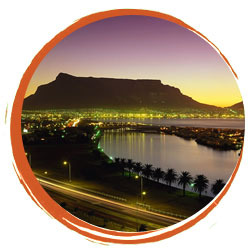 Warmed by the African sun, the city is dominated by a towering, table-shaped mountain, set on a peninsula of soaring, rocky heights and lush valleys, where two oceans converge- Indian and Atlantic. Immense natural beauty, and the fast pace and bright lights of a great urban centre meld effortlessly here. The top of Table Mountain offers spectacular views in all directions and gives a birds eye view of the city. The upper cable car station is situated at 1067 metres and the revolving cablecar makes sure that your trip up and down gives you a good look in all directions. Experience the history of the City of Cape Town and why Cape Town is the Mother City of the South Africa. Walk through the Company’s Gardens where the 1st Farm was established. Visit the Malay Quarters in Bo Kaap. Take the Cable Car or Hike up to the top of Table Mountain where you can experience the majestic views of Cape Town and the Mountain Range.